VietPress USA (Jan. 29, 2018): Today the Republican Lawmakers on the House intelligence committee voted to release a classified memo that purports to show improper use of surveillance by the FBI and the Justice Department in the Russia investigation. The four-page memo has become a political flashpoint, with President Donald Trump and many Republicans pushing for its release and suggesting that some in the Justice Department and FBI have conspired against the president. The memo was written by Republicans on the committee, led by chairman Rep. Devin Nunes of California, a close Trump ally who has become a fierce critic of the FBI and the Justice Department. Democrats have called it a selectively edited group of GOP talking points that attempt to distract from the committee's own investigation into Russian meddling. This Memo release could be considered as a big bomb blast in the Political situation of the US during this historical period. WASHINGTON (AP) — Brushing aside opposition from the Justice Department, Republicans on the House intelligence committee voted Monday to release a classified memo that purports to show improper use of surveillance by the FBI and the Justice Department in the Russia investigation. The memo was written by Republicans on the committee, led by chairman Rep. Devin Nunes of California, a close Trump ally who has become a fierce critic of the FBI and the Justice Department. Special counsel Robert Mueller is investigating Russian meddling in the 2016 election and whether Trump's campaign was involved. Republicans have said the memo reveals grave concerns about abuses of the government surveillance powers in the Russia investigation. Democrats have called it a selectively edited group of GOP talking points that attempt to distract from the committee's own investigation into Russian meddling. The vote to release the memo is an unprecedented move by the committee, which typically goes out of its way to protect classified information in the interest of protecting intelligence sources and methods. The memo was delivered by courier to the White House on Monday evening. Trump now has five days to object to its release by the committee. Republicans said they are confident that the release won't harm national security. They also said they would not release the underlying intelligence that informed the memo. But Rep. Adam Schiff of California, the ranking Democrat on the committee, said the panel had "crossed a deeply regrettable line." "Today this committee voted to put the president's personal interests, perhaps their own political interest, above the national interest," he said, noting that the memo's release could compromise intelligence sources and methods. While Trump's White House signaled he would likely support the Republican memo's release, his Justice Department has voiced concerns. In a letter to Nunes last week, Justice officials said releasing the classified memo could be "extraordinarily reckless" and asked to review it. Assistant Attorney General Stephen Boyd suggested that releasing classified information could damage the United States' relationship with other countries with which it shares intelligence. Rep. Trey Gowdy, R-S.C., who was with Wray when he reviewed the memo, said the FBI director did not raise any national security concerns with him. Gowdy said the memo doesn't reveal any intelligence methods but it does reveal "one source." 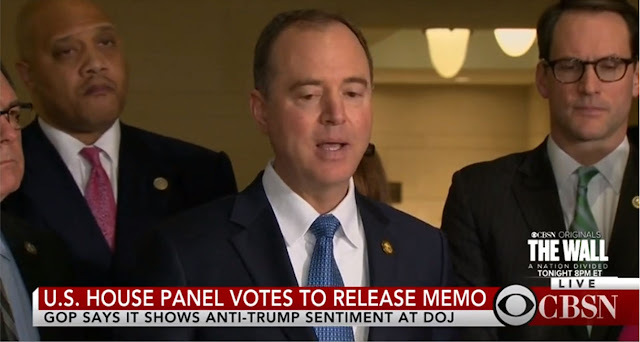 But Schiff said that Wray told him Monday that the review didn't satisfy his concerns about the release of the memo. Wray wanted to brief the committee about FBI and Justice Department concerns ahead of any release, a request committee Republicans blocked, Schiff said. Privately, Trump has been fuming over the Justice Department's opposition to releasing the memo, according to an administration official not authorized to discuss private conversations and speaking on condition of anonymity. At the behest of Trump, White House chief of staff John Kelly and other White House officials contacted Justice Department officials in the past week to convey the president's displeasure with the department's leadership on the issue specifically, the official said. In a series of calls, Kelly urged the Justice officials to do more within the bounds of the law to get the memo out, the official said. It is still unclear how exactly when or how the memo will be released. Conaway said the memo could be released within the five-day window if Trump signals his approval for releasing it. But committee rules don't address how that approval must be given — or what happens if it comes in the form of a tweet. Some Republican senators have said they don't want to release the memo, and Democrats have pushed back on Republican criticism of the FBI, saying it is an attempt to discredit Mueller's investigation. The probe has already resulted in charges against four of Trump's former campaign advisers and has recently moved closer to Trump's inner circle. "They will trample on anything to protect the White House at this point in time," said Rep. Mike Quigley, D-Ill., of the Republican move to release the memo. Late Monday, House Democratic Leader Nancy Pelosi blamed House Speaker Paul Ryan, who oversees the intelligence panel and has deferred to Nunes, whom she called a "stooge." She said on CNN that Ryan is allowing the release of a "false memo based on a false premise." Separately Monday, Schiff and Conaway said former White House chief strategist, Steve Bannon, will appear for a closed-door interview Wednesday. Bannon was interviewed by the committee earlier this month but refused to answer questions about his time in the Trump administration at the direction of the White House counsel's office. Bannon served on Trump's campaign and was the chief strategist in the White House until he left in August. Bannon's refusal drew a subpoena from Nunes seeking to compel him to answer the committee's questions. On Monday, Conaway said, "I expect our subpoena will be complied with."